I think I’ve seen this movie before – when it was called Gran Torino. Or was it Rocky? Or maybe it was The Wrestler. Or Who’s Life Is It Anyway? I don’t know. There’s a little of each of those movies in Million Dollar Baby. There’s something very familiar about this movie. Maybe I think that because the characters are remarkably ordinary. Maybe it’s because Clint Eastwood, who also directed the movie, looks and sounds like he did in Gran Torino and Unforgiven. He has that crotchety-old-coot-with-a-heart-of-gold who-shakes-his-fist-at-God character down pat. When I look at the other movies nominated this year (2004) I see why Million Dollar Baby won. It was up against The Aviator, Finding Neverland, Ray, and Sideways. Looks like 2004 was the year of slim pickin’s, and I don’t mean the actor. Frankly, the mid to late 2000s boasted some pretty awful movies. They got so political and serious and just plain vulgar. How does one pick from five movies that seem so similar? Inciting Incident: Happens at the 11:05 mark when Scrap (Morgan Freeman) spots Maggie (Hilary Swank) punching away on the speed bag at the gym owned by Frankie Dunn (Clint Eastwood) and asks him, “Who’s your new girl?” That’s when the move gets started. Plot Point I: At the 24:03 mark, boxer Big Willie Little (Mike Colter) stops by the home of Frankie Dunn and drops a bomb on him – he chose to go with a different manager to take him to the championship. Frankie is stunned, although he should have seen it coming. Everyone knows the departure of Willie makes room for the entrance of Maggie Fitzgerald, a trailer-trash waitress with a dream to be a boxer. The movie only gets good around the 33:00 mark. When Frankie agrees to take on Maggie, things get interesting. And Maggie gets downright endearing. I was prepared not to like Maggie. Or this movie. But something in Hilary Swank’s character got to me. Her scrappy, always-upbeat attitude won me over. But niggling doubts remain. For example, why does the plot seem to fit too neatly? Why is Frankie’s daughter estranged, but Maggie shows up to fill the hole in his life? And why does Maggie miss her father, but Frankie shows up to fill the hole in her life? Maggie tells the manager she’s never gonna leave Frankie. And she walks out. Maggie’s career takes off in a big way after that. She travels to Europe, winning every time. She returns to the U.S. to fight one of the meanest, dirty-fighting babes in the ring. It’s a million-dollar bout in Vegas. Plot Point II: 1:32:00 mark Maggie is sucker punched in that Vegas ring and hits the mat – and a stool – hard. She’s out. And likely out of the fight forever. She awakens in the hospital, paralyzed and unable to move – for the rest of her life. The rest of the movie is about Maggie dying. And Frankie praying (which was tough for a man who’s at enmity with God). And Maggie’s trailer-trash family trying to get her to sign over her assets before she dies. And letters Frankie mailed to his estranged daughter marked Return to Sender continuing to show up on his doorstep. And Frankie deciding whether or not to pull the plug on Maggie. He does. And then he disappears. The last words spoken in the movie are those of the narrator, Scrap (Morgan Freeman). Nope. That Plot Point II was one of the biggest and most unexpected I’ve ever seen. I know something bad was coming. But how bad, when, where, and why I didn’t know. Overall, I liked Million Dollar Baby more than I thought I would. 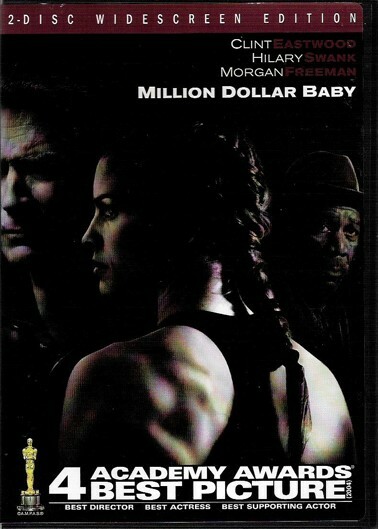 Million Dollar Baby was nominated for seven Academy Awards and won four: Best Achievement in Directing (Clint Eastwood), Best Motion Picture of the Year, Best Performance by an Actor in a Supporting Role (Morgan Freeman), and Best Performance by an Actress in a Leading Role (Hilary Swank). NOTE: Morgan Freeman was in three Academy Award-winning movies. Three. I’ve always liked Morgan Freeman. So I’m really glad he’s earned so many accolades for his work. Final note: This is the 59th adaptation out of 77 Best-Picture winners. The percentage is now 69%. If you’re a screenwriter – or a producer, for that matter – start looking for books to adapt. Hollywood favors adaptations.